3-PACK - Precise Tip Size for More Accurate Highlighting. 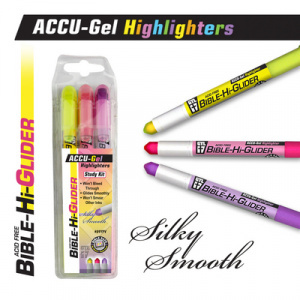 Best Selling Solid Gel Ink Glides Smoothly Across the Page. WON'T BLEED THROUGH Any Paper! DOESN'T SMEAR Other Inks When Highlighting Over Them. Long-Lasting Gel Stick Advances by Twisting Base. 3 Bright, Transluscent Colors. Yellow Pink and Violet. HIGHLIGHTER HIGLIDER ACCUGEL by G T Luscombe was published by LUSCOMBE #129 in March 2013 and is our 3650th best seller. The ISBN for HIGHLIGHTER HIGLIDER ACCUGEL is 634989895786. Be the first to review HIGHLIGHTER HIGLIDER ACCUGEL! Got a question? No problem! Just click here to ask us about HIGHLIGHTER HIGLIDER ACCUGEL.